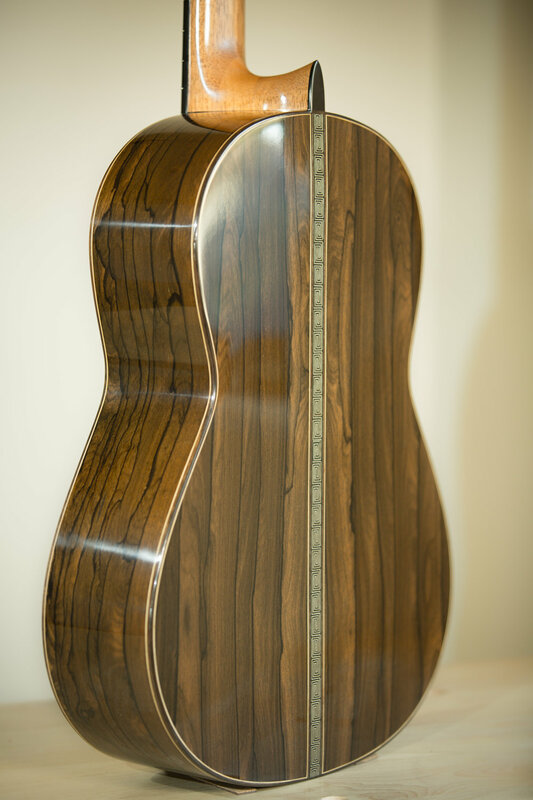 Brazilian rosewood back and sides with the Torres meander pattern accent. Top is cedar/balsa-wood with my unique grid core. French polished throughout. Scale is 650 mm. Very powerful and responsive with a delicate attack enabling the player a dynamic color palette. One of the most beautiful guitars I’ve made. 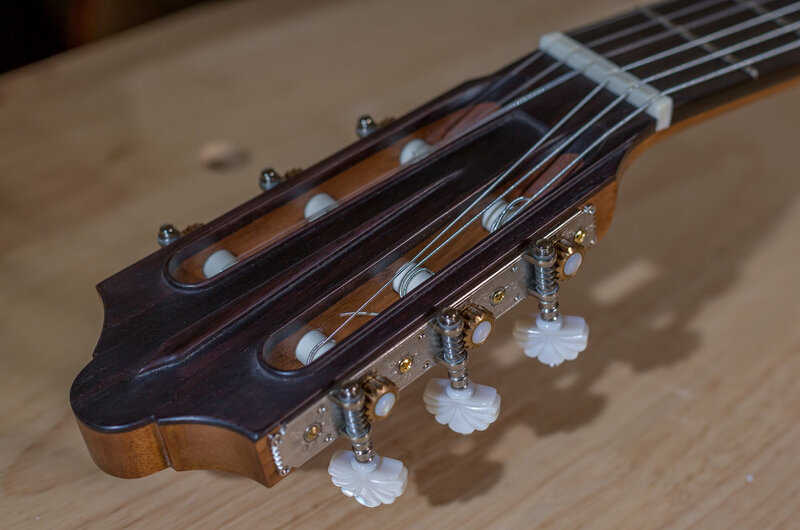 Gotoh premium tuners. 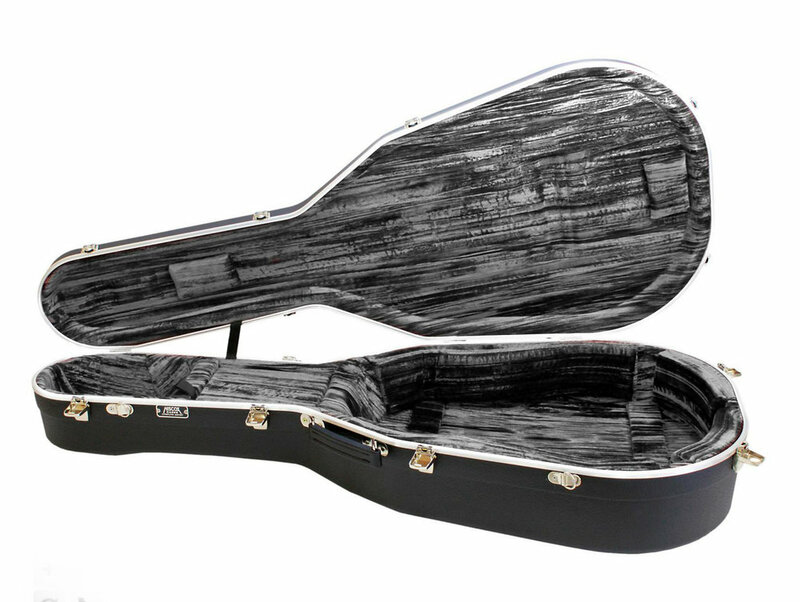 This guitar comes with a Hiscox Artist series flight case, in either Ivory or black color, see photos below. Price $8400. 4/20/2019. 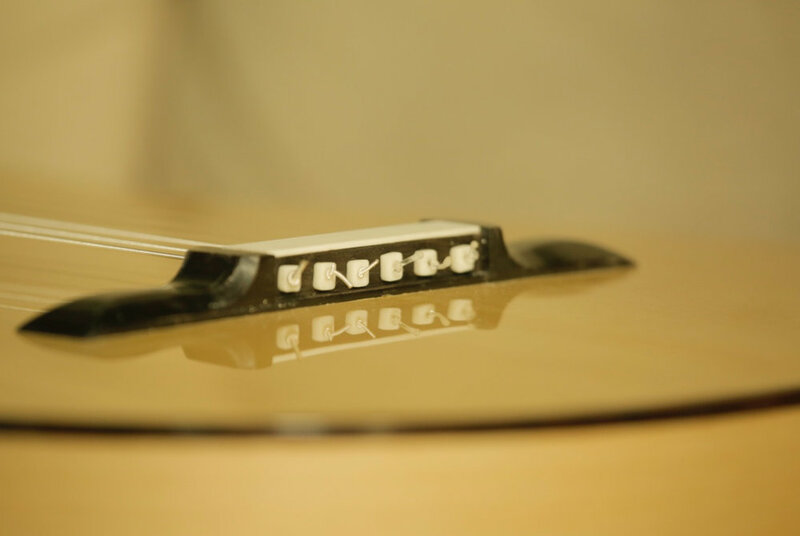 Cedar Balsa wood core DT guitar available 1/20/2019. Very powerful/responsive, poppy trebles, and punchy dark aggressive basses. One of my best DT guitars to date! Sloane tuners with snakewood buttons. Price $7500. Comes with a Hiscox Pro II case. SOLD. Just completed Balsa core DT. Raised fingerboard, with an Ancient Dragon soundboard made from a 500 year old "moon-wood" cedar top. Torres meander pattern down the back. 50 year old East Indian rosewood back and sides and French polished throughout. The head is Frederich inspired. 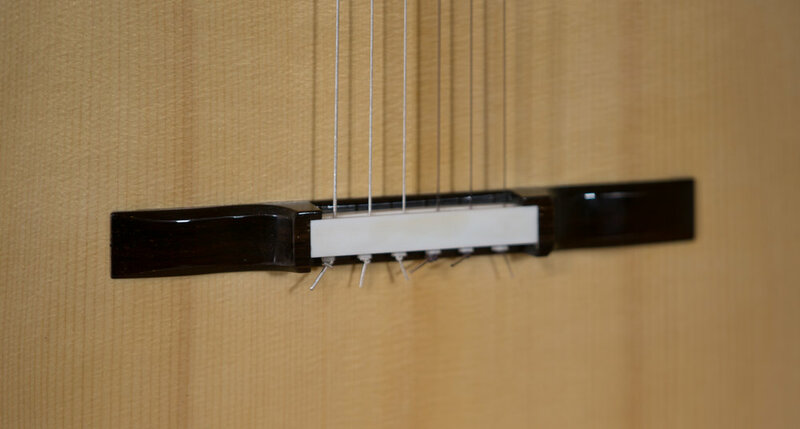 Comes with Gotoh Premium, or Sloane tuners. Scale is 650mm. Price $7200. SOLD 7/9/2018. 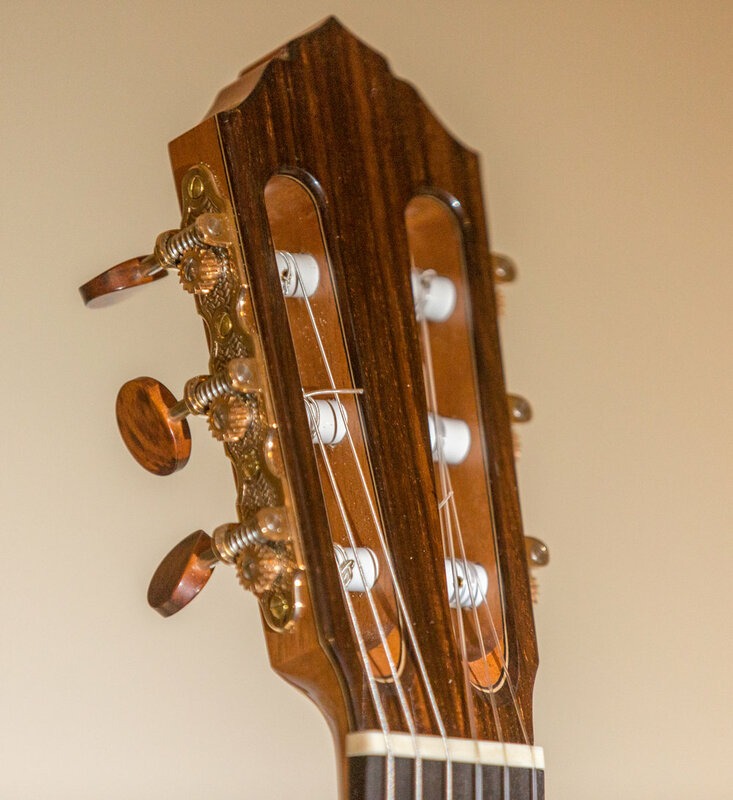 Brazilian rosewood back and sides, with a Rudolf Fuchs soundboard and raised fingerboard. This was the first guitar I made for Matt Palmer, Matt played this guitar for one year in concerts. With Sloane tuners. 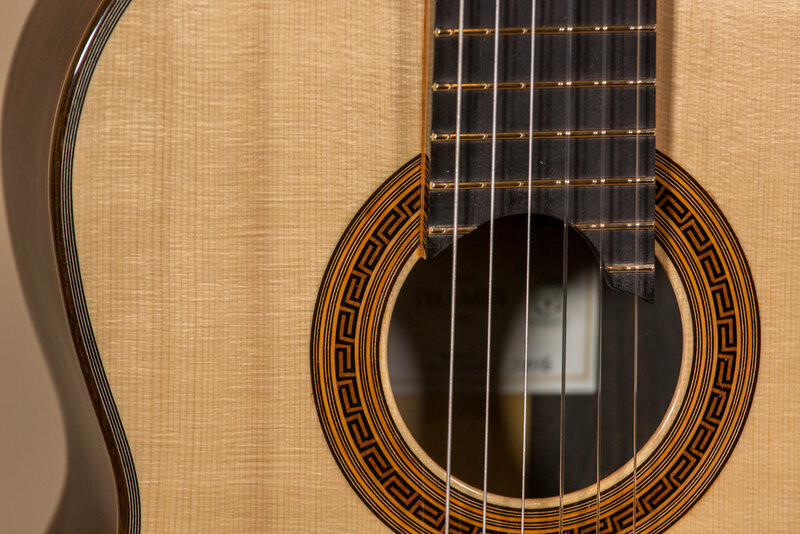 This guitar has the beautiful Torres meander pattern down the back center and tail. Available 6/8/2018. Sold... 6/11/2018. This is really a fantastic DT guitar. Finished it March 7th then headed to Thailand the next day and wasn't able to upload any photos there..... so here it is. Cedar veneers with balsa-wood inner core. 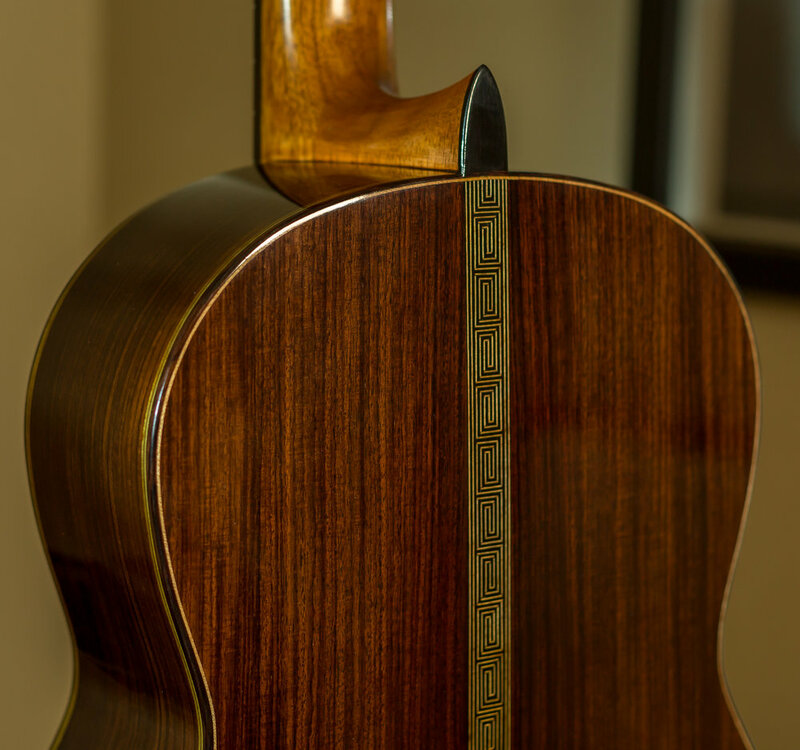 Back and sides are East Indian rosewood aged for 45 years. Back/sides, and neck lacquered with a French polish/lacquered top. Scale is 650mm. Very loud and refined sounding with poppy trebles and a deep bass! Price $7800. Spruce Indian rosewood available now 1/23/2017. $7500. Copy of Torres Famous "La Leona". 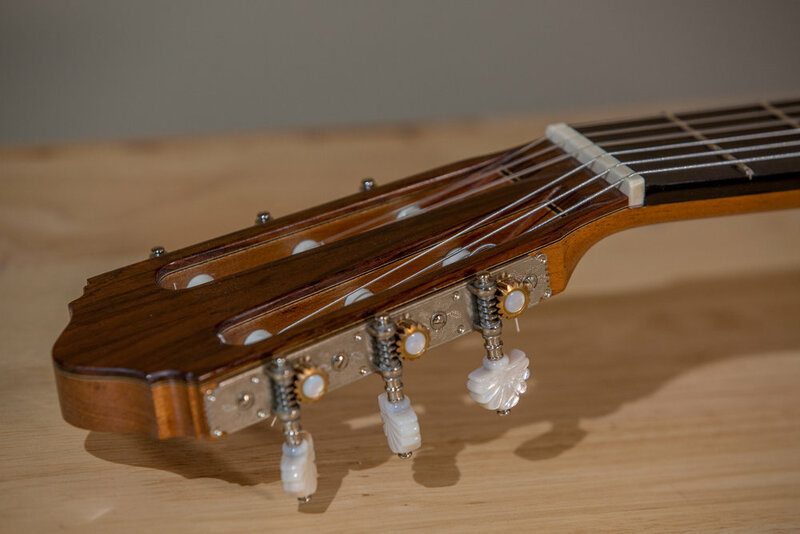 This guitar was originally made for a client who changed his mind during the construction for fiction pegs instead of mechanical tuners. So I'm making him another La Leona, and offering this one for sale. The back and sides are of Mediterranean cypress (aged 10 years), like the original La Leona. Spruce top aged 30 years. The bridge is an excellent copy of the original La leona bridge. The tie block opens for addition adjustment of the action. La Leona was reputed to have a secret bridge, this can only mean one thing..... that the original had a concealed hollow inner part. I have made this same bridge on a few other La leona's but incorporated a traditional saddle. On this La leona I did it just like the original, and so I feel gives it a more authentic sound. I received some very special rosewood sets from Rahoul Waghmare from India. The wood was sitting around my shop talking to me, asking me to make them into a guitar or two..... so I did. 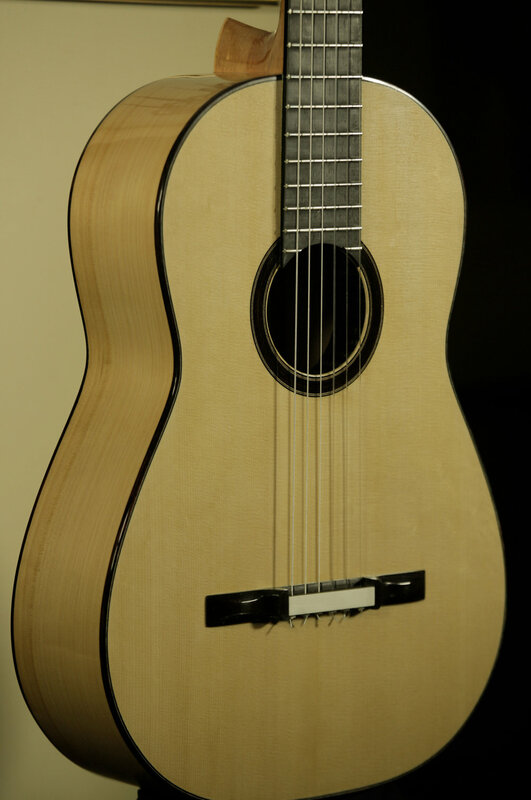 This guitar has a 30 year old Engelmann spruce top full of striking medullary across the entire top. 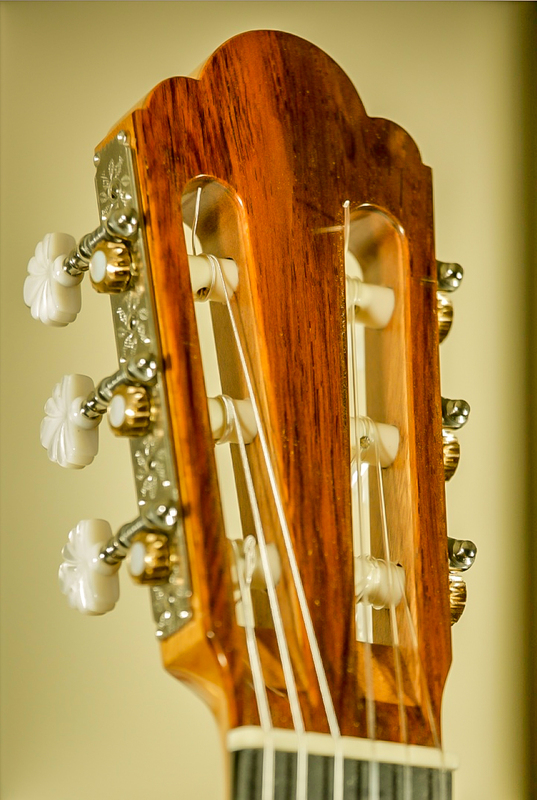 Select Indian rosewood, and entirely French polished. With Gotoh premium tuners. Extremely nice crystal poppy trebles, and dark rich basses. Volume is never an issue with my guitars so I won't comment on that.... ha! Very special guitar. I made a sister guitar to this one out of the exact same back and sides except with a dark 500 year old cedar top, that will be available sometime next week as well. Click on the image for side show. Click on the image for slideshow. Tores FE-17 reproduction available now June 21st 2016. Copy of the Original Torres FE-17. 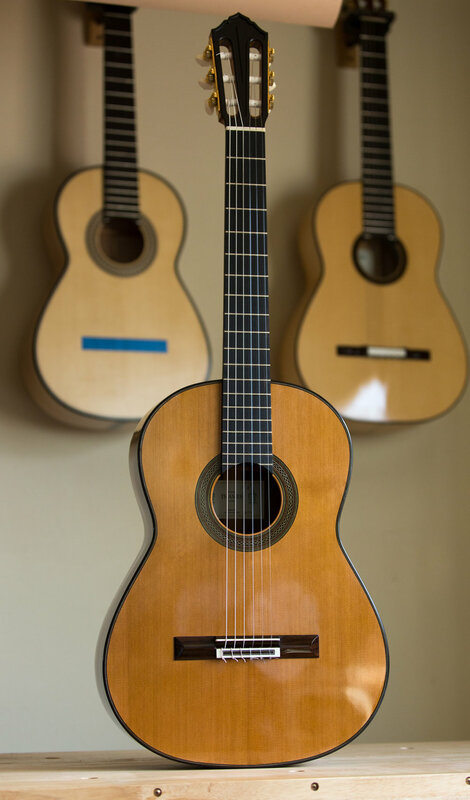 When young Francsico Tarrega visited Torres to purchase a good guitar, Torres gave Tarrega a guitar to try. 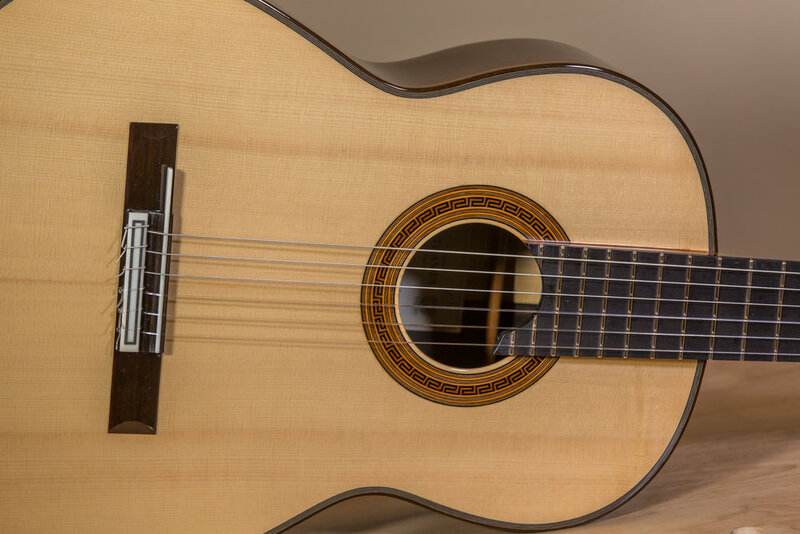 After hearing Tarrega Torres immediately recognized his extraordinary Talent and when into his private room and brought out his own personal instrument FE-17 and gave it to Tarrega. 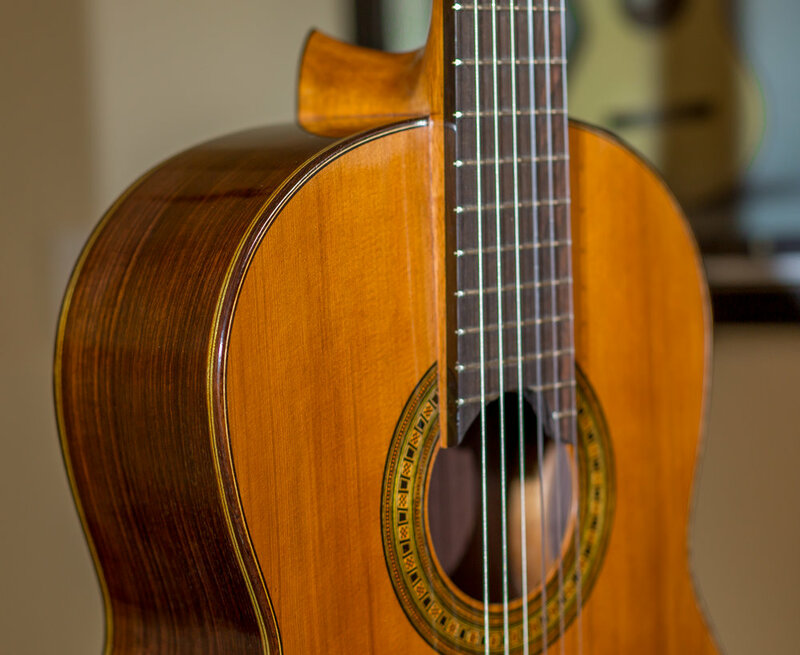 Tarrega played this guitar for the first 20 years of his life. 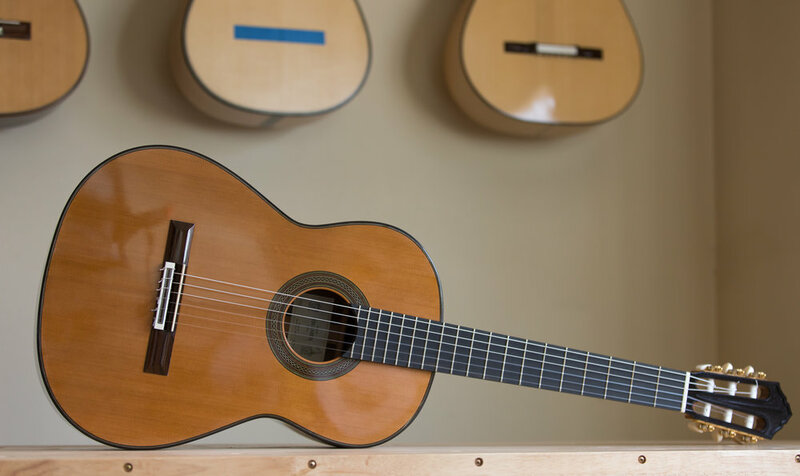 Tarrega acquired his first Torres guitar in Seville in 1869, FE 17, a guitar which, according to Emilio Pujol, Torres had made for his own personal use. 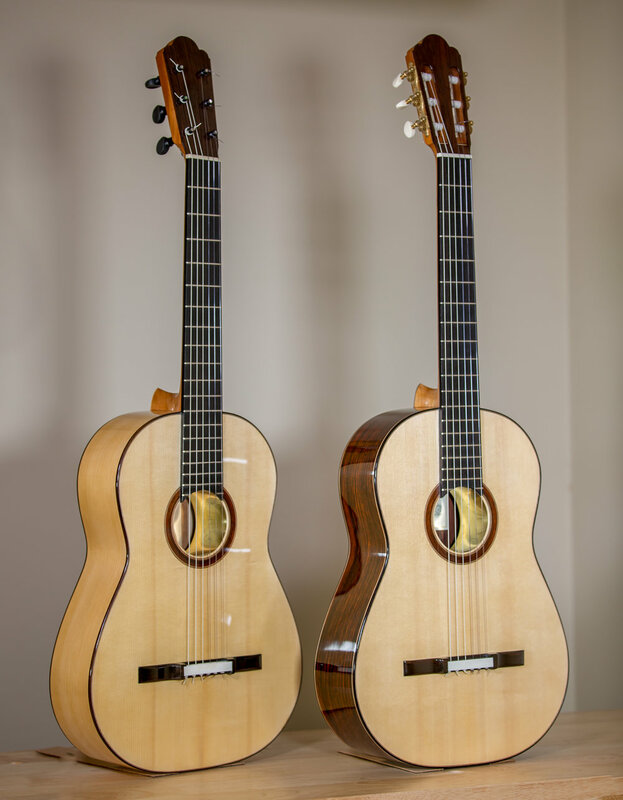 He was later to acquire two more Torres guitars, one made in 1883 (SE 49) and the other one in 1888 (SE 114). 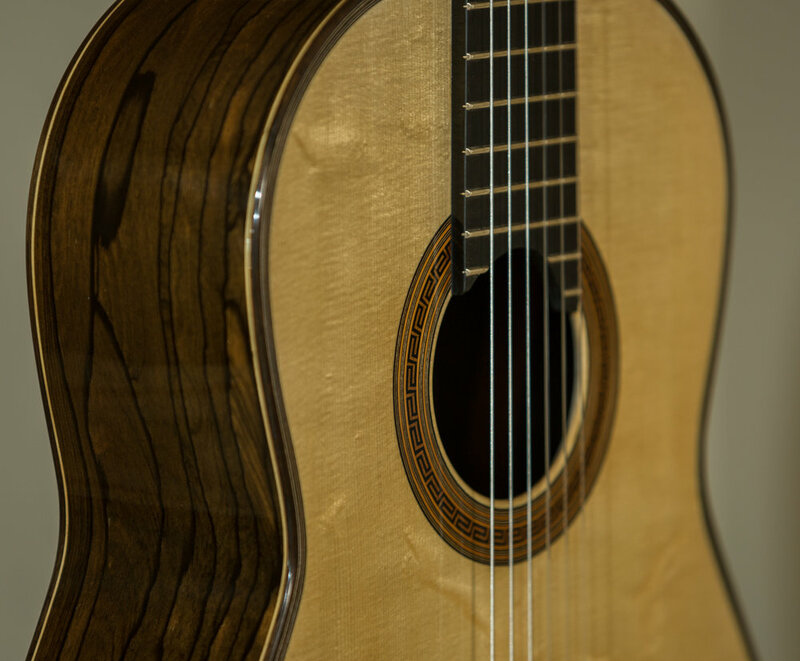 His first Torres guitar had its back and ribs made from flamed maple and although the maple used by Torres was of good quality, the flame pattern was somewhat irregular, particularly in the figure used for the back. 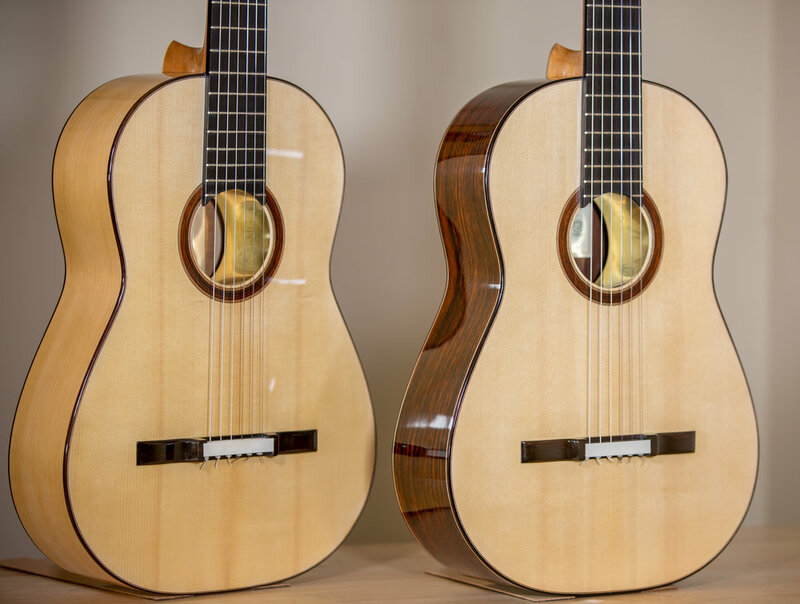 Emilio Pujol ……… It was made from maple, with the soundboard in spruce, the neck and the head in cedar and the fingerboard in ebony. The size was slightly smaller than the usual one. 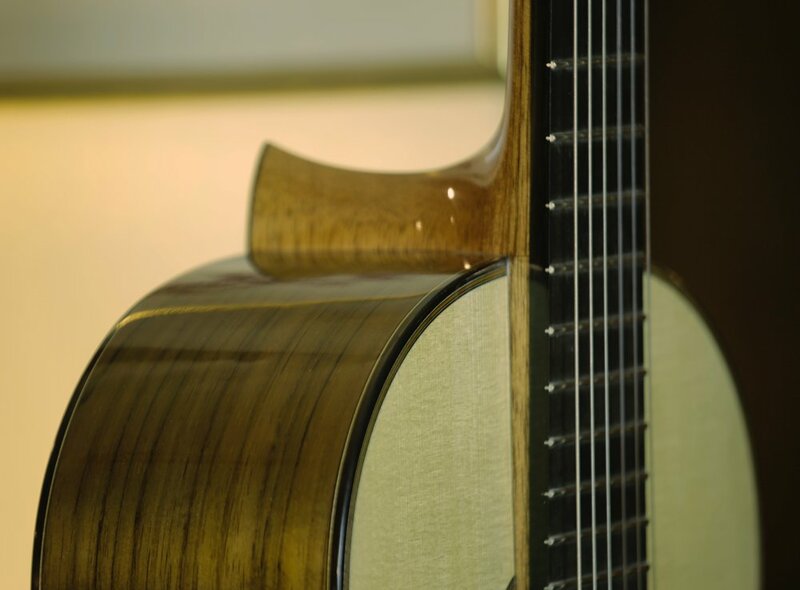 Its soundhole and contours were bordered with the finest of inlays of a pale green shade with double herringbone purfling; on the head, the back, and the ribs was an exquisite rectangular meander inlay. In addition to the spontaneity of the sound, perhaps due to its tornavoz, there was its clear, warm timbre as if it were of gold. 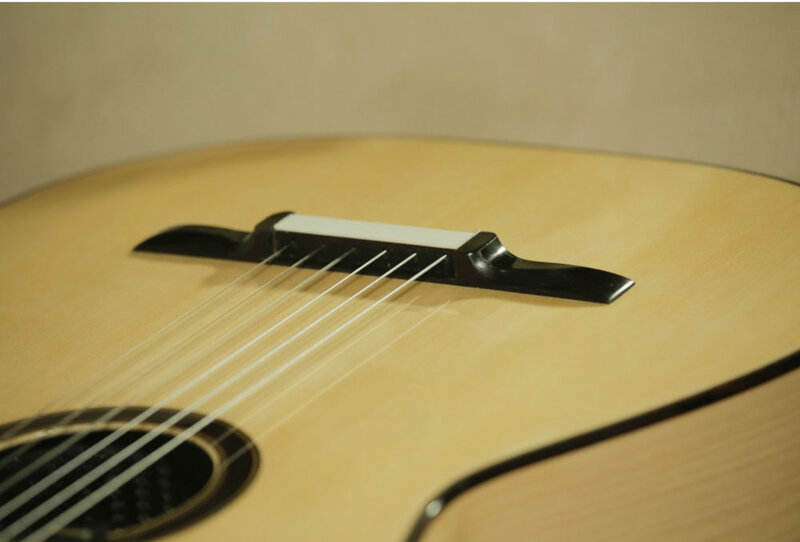 The balance between bass and treble was proportionally exact in volume and the duration of its vibrations equally generous throughout the fingerboard. It sufficed to finger a perfect chord in order that, by plucking only the three bass notes one could clearly perceive the harmonics of the other strings.